Life on a Contessa 26 is always close to the water. One of the things that I miss about my Contessa 26 is being able to easily reach over the side and put my hands in the water. I can reach the water from the deck of Idle Queen, but it is a bit of a stretch, and I have to put an uncomfortable amount of my body over the side of the boat, so I don’t do it. Instead, I use a bucket attached to a line to haul water to the deck of Idle Queen. 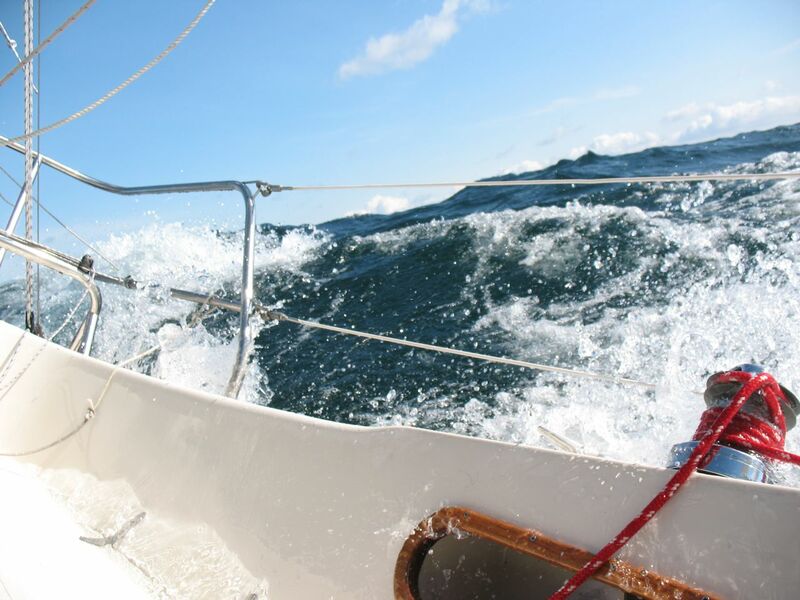 Besides making washing things over the side a little less convenient, there are other disadvantages to all that extra freeboard–like sluggish windward performance; more hassle getting out of the dinghy; and handling issues when the wind gets up. No matter how you look at it, anything that increases windage is a bad thing, and more freeboard increases windage in a big way. This has been known to designers for a long time, and is part of the reason why many old-school sailboats were so low to the water. 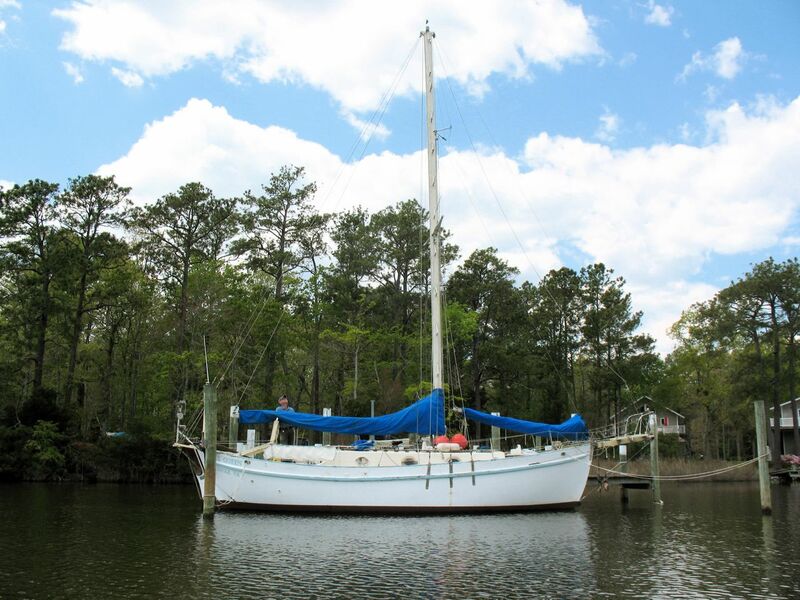 When Sirocco had to ride out the remnants of hurricane Irene on an exposed mooring, she sat quietly despite the whipping gusts largely thanks to the fact that she sat so low in the water. Sirocco charging down Long Island Sound. A boat that is excessively low to the water will have the decks frequently washed over by waves, so there is definitely the potential to take the low-freeboard idea too far. My point is that once past a moderate amount of freeboard, the returns paid in dryness will diminish just as quickly as the negatives, like sailing around at anchor, will pile up. Besides, boats that are low and lean just look sexier. I just took down the signs a few minutes ago. Sirocco has been sold as of today and will soon be going to a new home. 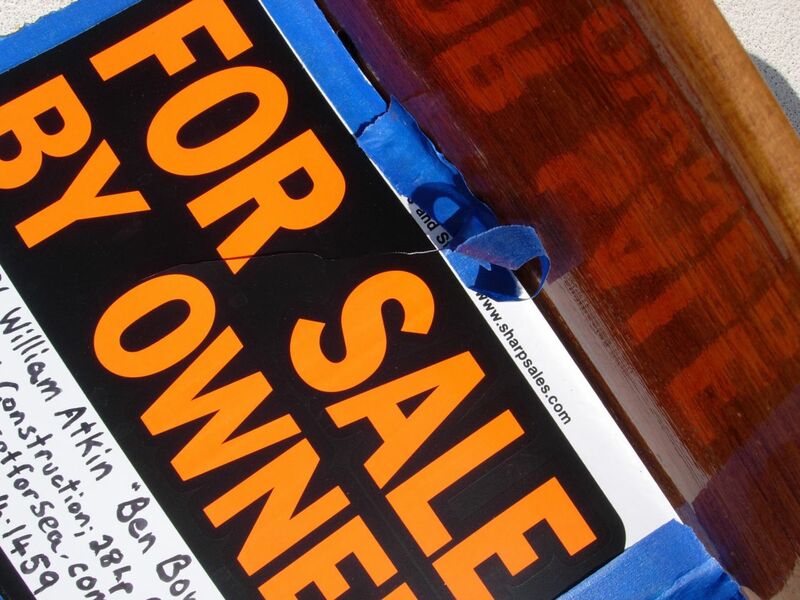 There is an old saying about the two happiest days in a boat owner’s life being the day that one buys the boat, and the day one sells the boat, but that saying is not true for me in this case. I had many wonderful days with Sirocco. Today is a sad one. The past weeks I have been working on Sirocco to make her more beautiful, but she was still completely mine and I was working for my own benefit. It was enjoyable putting a new shine on wood that had long been left grey, and fixing little things that had stayed too long on the “to do” list. Many days showed visible improvement. Now, I have a little more varnishing to do; some hardware to remount; a coat of bottom paint to put on, and some cleaning to do, but these things are all for the new owner. It will take me a little while to get used to that new fact. I feel confident that Sirocco is going to a good home. Hopefully her new owner enjoys this wonderful boat as much as I have. Just posted: a new video of Sirocco reaching offshore in beautiful weather. It does a great job of showing how easily she moves through the water. To watch this video with better quality than the “embedded” player here, and for more videos, please visit the Setforsea YouTube channel. 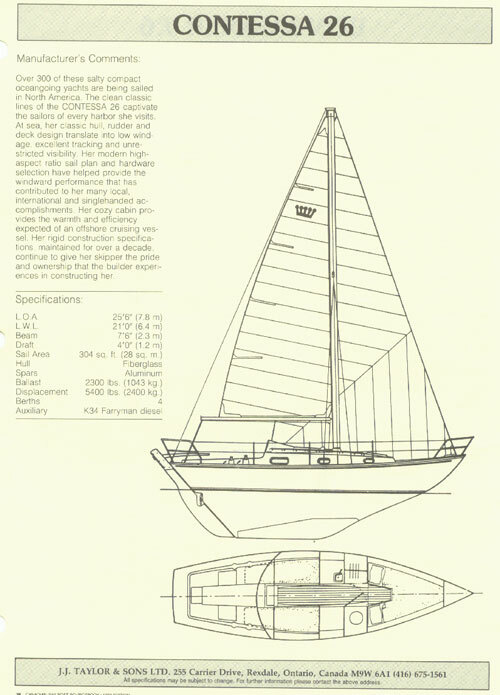 A line drawing of Sirocco, a true full-keel boat. Sirocco is a “Ben Bow” designed by William Atkin. Over the years that I have been sailing, I have logged miles on a number of different craft from an International Sabot up to a steel schooner of about 200 gross tons. 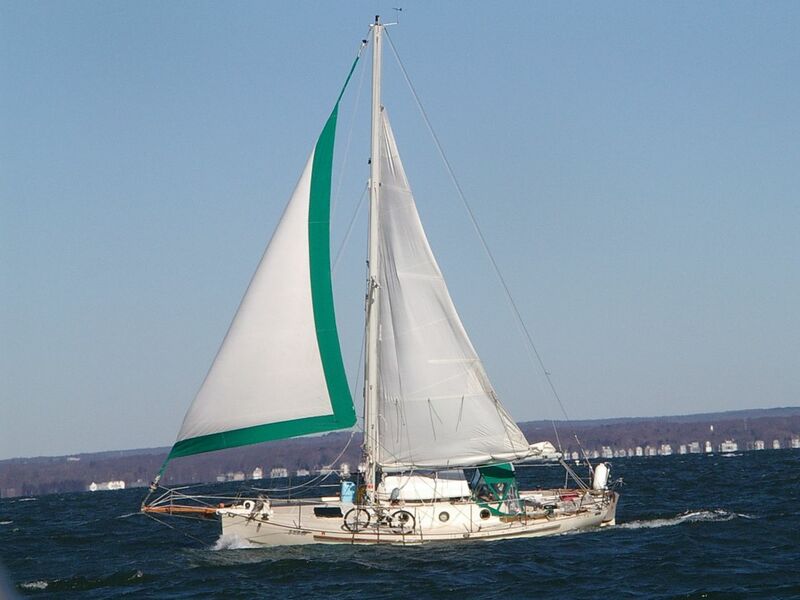 Most of my time has been in small, shoal-draft centerboard sailboats up to about 20 feet long; racing keelboat designs like the J-29; and the few cruising sailboats that I have owned over the years. 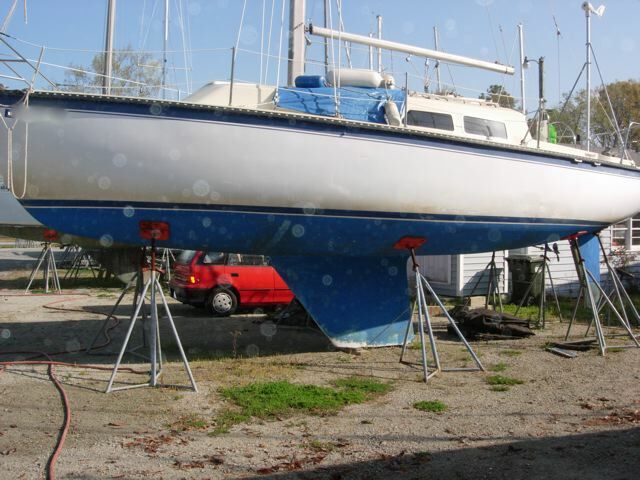 I benefitted from spending time in a broad variety of different sailboats by getting a taste of how different types of boats perform in various conditions. This has given me the opportunity to compare the merits of the different classes of boats. 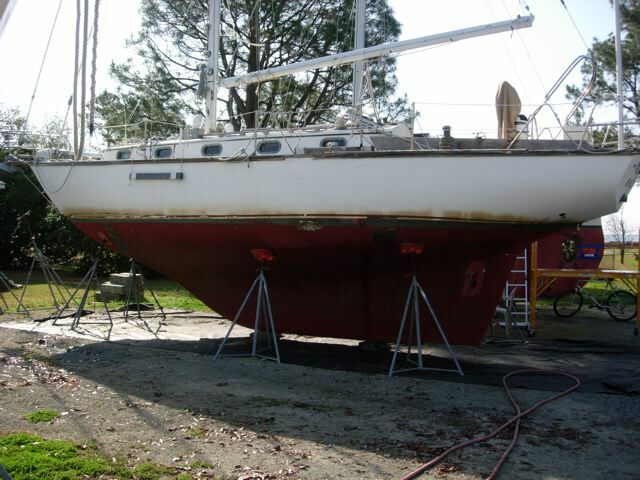 Picture of a generic fin-keel boat. It is easy to see how exposed the propeller and rudder are. Having the rudder right near the stern, far away from the keel, contributes to good steering characteristics, though. When I was younger, I craved performance. I wanted nothing more than to just go as fast as possible on the water. My desire for speed eventually led me to become a windsurfing enthusiast, but that is a whole other story. During my high-school and college years I spent a lot of time in International, and then Collegiate 420’s, a two-person dinghy. I thought they were slow and longed to spend time in a more performance-oriented dinghy, even though the 420’s could easily plane and give a good ride when the whitecaps showed up. When I started sailing keelboats, it was mostly the smaller J-boats (24’s and 29’s, mostly), but there was time spent on numerous other designs. I loved the taste of performance multi-hull sailing that I experienced as fill-in crew aboard a Nacra 6.0. The boats that I sailed in my teens and twenties were mostly well-regarded classes that taught me what a fun, responsive boat felt like. They sailed well in a wide variety of conditions with good speed and few bad habits. There is a reason that the one-design dinghies and keelboats that I sailed in were such popular designs–they were good all-round boats. Picture of an Alberg-designed Cape Dory with a cutaway keel. There is a concave shape in the profile up forward, with the keel really beginning under where the second cabin porthole is. The rudder is attached to the trailing edge of the keel, offering some protection and making it less likely to snag lines and other debris. 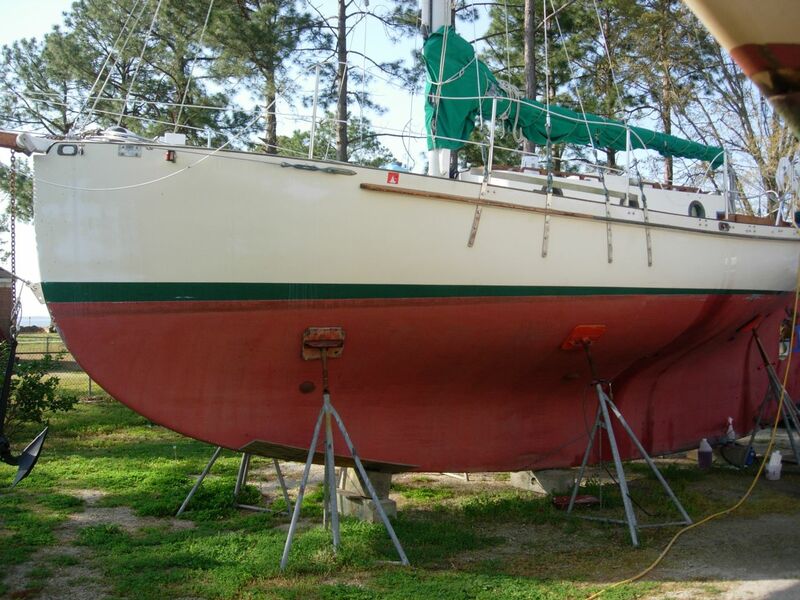 When I finally had enough money to consider buying my own sailboat I began to consider all aspects of its use. I couldn’t really justify spending a ton of money on a boat that was only good for racing. By this time my sights were fixed on the far horizon rather than outright speed. I wanted to explore the world from the deck of my own sailboat, so I decided to look for a reliable design that could take me anywhere I wanted to go. What I ended up with was a Pearson Vanguard–a 32-foot racer/cruiser designed to the old Cruising Club of America rating rule. Buying the Vanguard was a huge step for me in many ways. 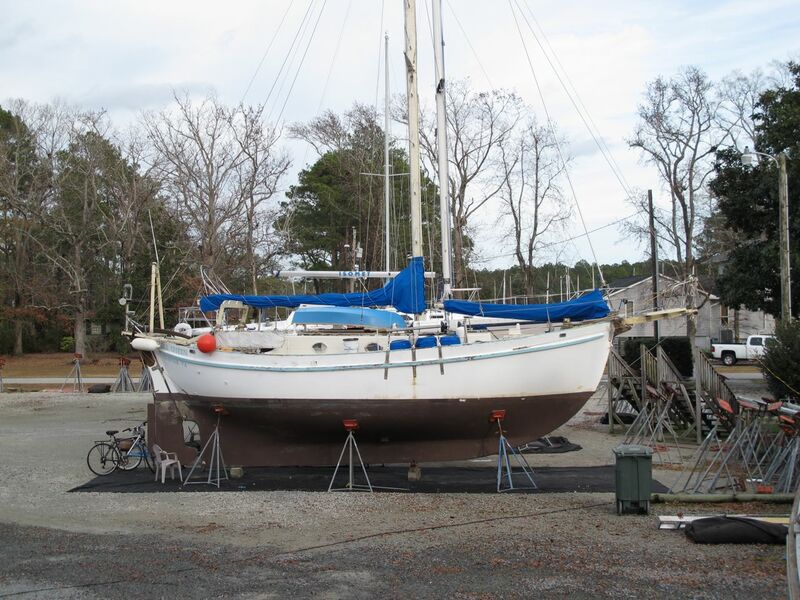 It was the first “big” boat that I had ever owned, it was my first home on the water, and it allowed me my first significant experience with something other than a centerboard or fin keel design. Side-view of the Pearson Vanguard, showing the cut-away in the forward part of the keel. The Vanguard has a “cutaway” keel with the rudder attached to the trailing edge. Looking at the profile of the boat, there is a lot of area that has been cut away, or hollowed out, making the deep part of the keel start a long way back from the bow. This is done in an effort to reduce the amount of boat in contact with the water, or wetted surface, to make the boat faster when the wind is light. This design achieves its intended goal of reducing wetted surface, but pays the price of introducing a couple of undesirable handling characteristics. The one that I remember most is how the bow would blow downwind when trying to maneuver at low speed. The high bow and long forward overhang on the Vanguard would catch the wind, turning the boat broadside to the wind very quickly. There was no underwater surface to counteract this tendency, and the rudder was way under the boat at the end of the shortened keel. This reduced the rudder’s effectiveness by giving it a shorter lever arm for turning the boat. Fin-keel boats don’t have a surface underwater up forward to stop the bow from blowing away from the wind either, but their rudders are placed farther back on the boat, which gives a stronger turning force and allows better control in low speed situations (especially in reverse) compared to the cutaway-keel boat. A cutaway-keel boat tracks better than a fin-keel boat. The Vanguard didn’t need constant, minute attention to the helm. I could count on her to track well if I needed to adjust a sheet or otherwise divert my attention for a moment. This is a great characteristic to have in a cruising boat. I could balance the boat and let her sail herself for a while if I needed to go forward to attend something or use the head. I have had some luck locking the helm down on a fin-keel boat to keep them going straight for a short while, but this technique is not as effective as when used on a cutaway-keel boat or a full-keel boat. The Contessa 26 has a cutaway keel, but it is much longer than the one on the Vanguard–closer to a full keel.